We use the best search feature and capability to find the lowest and best prices for your medications. 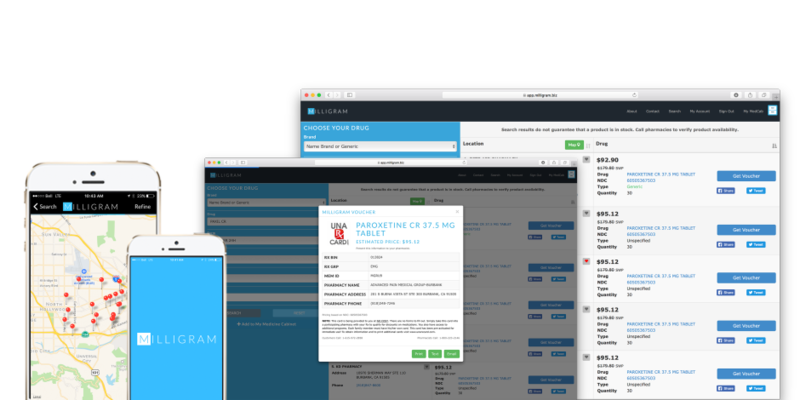 Milligram was created as a web-based medication price transparency engine. 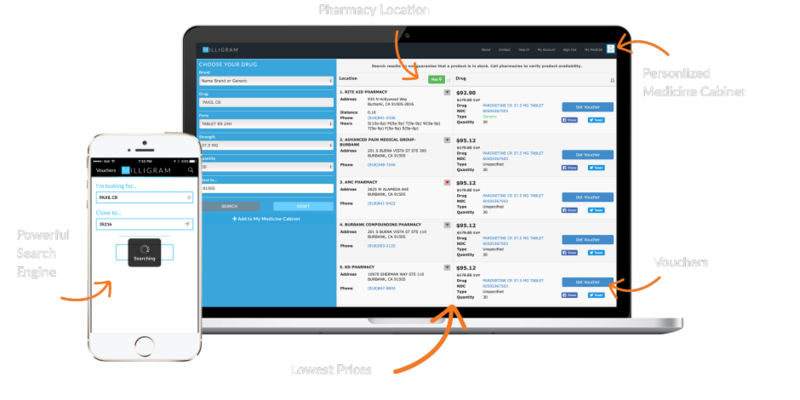 Our software helps patients and providers find medication at the lowest price in any given zip code. Our translations support English, Spanish, Tagalog and Chinese. With our three data partners, Milligram searches prices of medications nationwide at 65,000+ pharmacies, offering the lowest prices on the internet. Download the app or use the Milligramrx.com website. Type in your prescription name and zip code, and hit search. Milligram will give you a full list of local pharmacies with discounted prices. You can adjust your preferences and view a map to make sure that you're choosing the best location. Select the best option for you and you'll be given a voucher. Print out a voucher and bring it to the pharmacy for your Milligram price or present the barcode on your smartphone to the pharmacist. Save money! Sign up for your own personal medicine cabinet (MedCab) and you'll a few of these special benefits and more! Search and save pharmacies of your choice that are nearest you. We offer discounts from big name companies to small, privately owned stores. Keep your medicines organized with alerts, reminders and interaction warnings between multiple medicines. Sign up for MedCab for free today. The Switch Engine allows healthcare professionals to find the best drug for their patients at the best price, allowing an appropriate and affordable treatment plan to be developed. Prescription prices are updated on a regular basis to assure that you are always getting the best deal! Safety alerts and drug-drug interaction warnings will keep you up to date and on track with your medicines. Drug pricing updated daily at 65,000 pharmacies. Your pharmacy pricing versus less expensive alternative pharmacies. Sign up for your own personal MedCab today and start finding the lowest prices for your medications. Try our free app now! On the go? Download the Milligram app, now available for both Apple and Android users. Save vouchers for multiple meds and most importantly, find the best deal for wherever you may be. Download the latest version for your iPhone. Download the latest version for you Android. Milligram has formed a partnership with other innovative pharmaceutical companies. As a team, we commit to our goal of healthier patients whether it be through strategies for patient compliance or offering prescriptions at lower costs. We try and provide the best news you will find. Here are some informative articles. "This past winter I was diagnosed with Strep Throat and unfortunately, it happened while I was waiting for changes to my insurance policy. With the help of the Milligram app, I was able to pick up a 10-day supply of generic Augmentin antibiotics for $7.50 at my local pharmacy right after leaving the clinic, instead of paying the full price of almost $70! Milligram made is easy for me to buy my prescription at a fair price and right near my house!" "I was given a prescription for Clobetasol Propionate, 60gm. I called a local pharmacy for a price and it was $413. I went to milligramrx.com and got a much lower price at Walmart and a coupon. The final cost was $24.99 for a 15gm tube."